The Northlawn renovation took another step forward Jan. 16. when Hesston College learned a grant provided by the Mabee Foundation awarded Hesston College $500,000 for the project. The Mabee Foundation is a non-profit corporation that provides aid to Christian religious organizations, charitable organizations, and institutions of higher education. A Jan. 17 email from President Howard Keim to Hesston Colllege faculty and staff noted that work on the new building will begin in December of 2014. “Overall, I see the renovation as a big step forward for all of our performing arts programs,” said Keim. With large gifts secured from Excel Industries (Hesston, Kan.) and Jayco Ic. (Middlebury, Ind. ), as well as $500,000 committed from donors, the $3.8 million project only needs $1.2 million before renovations begin. “We hope to have fundraising completed by December 2014 in order to begin renovation work as soon as the fall semester ends and through Spring 2015,” Keim said. 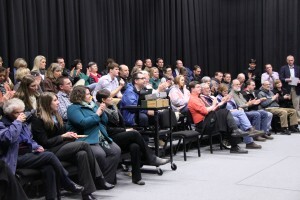 Faculty and staff gathered to celebrate the grant news Jan. 27. The renovation is intended to create a more inviting space for the performing arts. 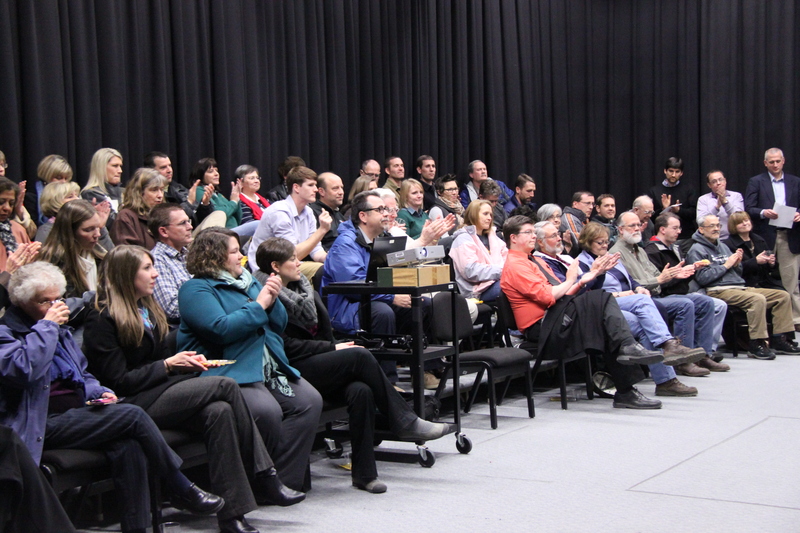 It will include a new space for Campus Worship, a new sprung (shock absorbing) floor, rehearsal space, and classroom. With renovations coming during the spring semester of 2015 students will need to make adjustments. Classes will be held in the church rather than in Northlawn. “We plan to have everything ready when students return in the fall of 2015,” said Keim. In addition to the space benefits, Keim says the renovation makes good economic sense. “Because of efficiencies gained in heating and cooling, we will be able to double the usable space while spending the same amount on utilities,” Keim said.